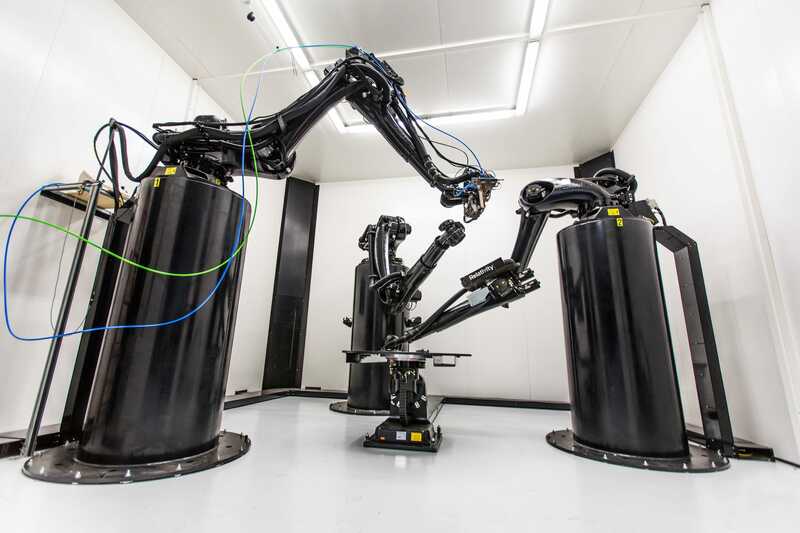 Relativity SpaceStargate by Relativity Space is arguably the largest metal 3D printer in the world. There is no wiggle room once you land on Mars. You either have what you need to survive, or you die. That risk is dramatically portrayed in the sci-fi book and movie “The Martian,” in which a stranded astronaut survives on leftover potatoes, freeze-dried faeces, and a lot of gumption. But the harsh realities of Mars loom in a fast-approaching future. 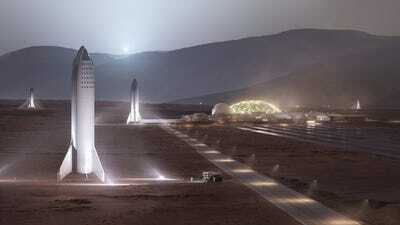 Elon Musk’s aerospace company, SpaceX, aims to ship people to the red planet and colonize that world on an eyebrow-raising timeline – perhaps as soon as 2024. 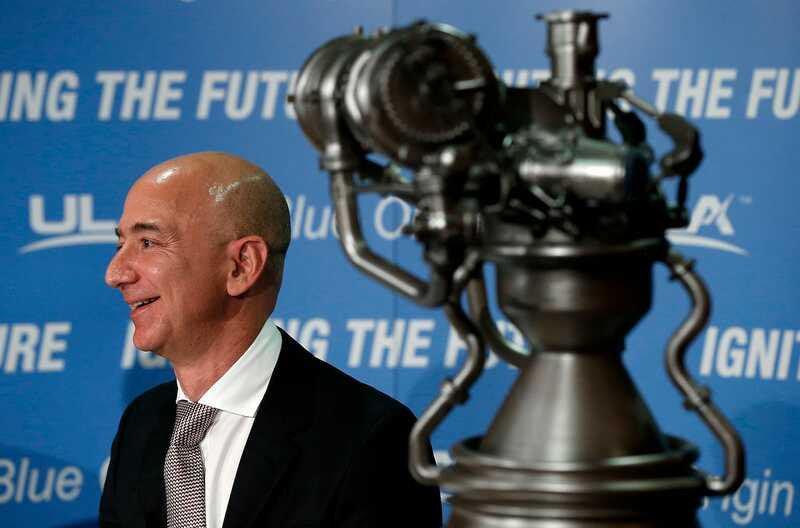 Meanwhile, Amazon CEO Jeff Bezos is pressing to colonize space with his spaceflight company, Blue Origin. Even NASA is working hard (though with some stumbles) to build a towering interplanetary rocket called Space Launch System. 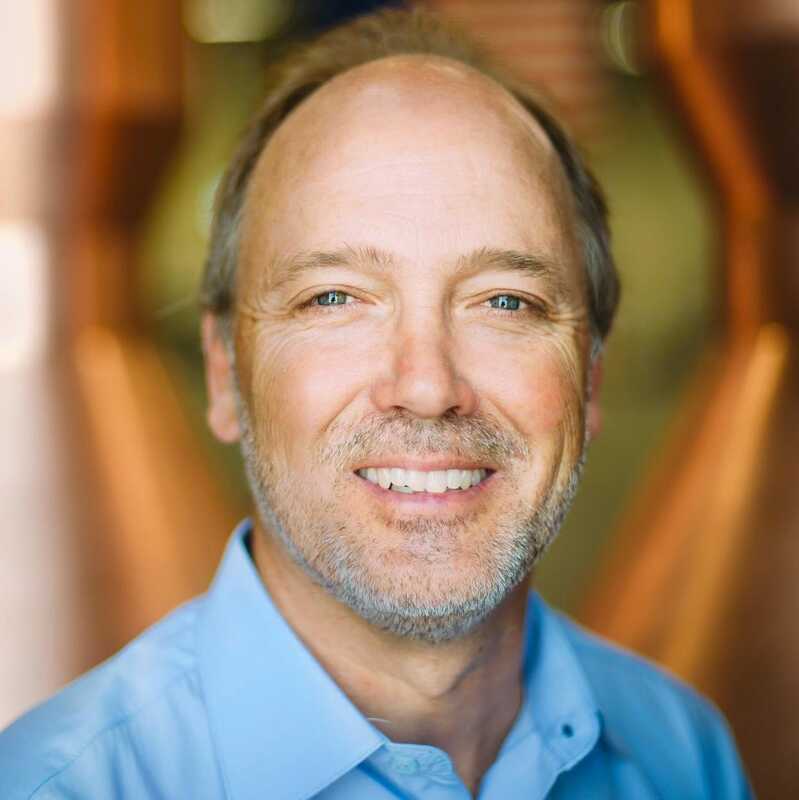 That’s where the upstart rocket company Relativity Space, which has backing from Mark Cuban, sees a vital opening for business. 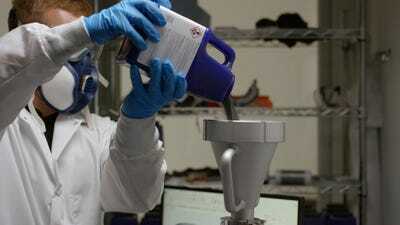 “We feel like it’s inevitable that if humanity is going out to colonize other planets, 3D-printing is really the only way to manufacture things like tools and replacement parts,” Tim Ellis, a co-founder of Relativity Space, told Business Insider. Ellis is a rocket-propulsion engineer who formerly worked at Blue Origin. “So that’s what we’re working on: How to 3D-print an entire rocket,” he said. Space colonization is a distant business venture for Relativity Space, though, since Mars-bound spaceships won’t get off the ground until the 2020s at the very soonest. Here’s a look at what the company is doing right now and how it plans to achieve its long-term vision. Win McNamee / Getty ImagesJeff Bezos, the founder of Blue Origin. 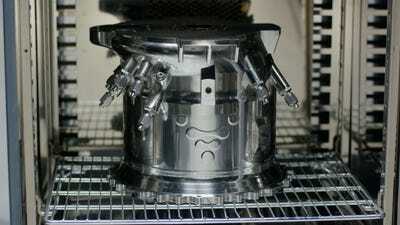 The kind of 3D-printing Ellis is referring to is called laser sintering. 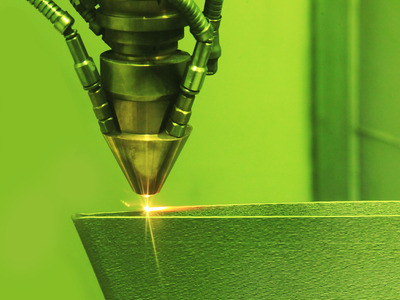 The system uses laser beams to bond powdered metal, layer by layer, into precise and complex structures that have minimal parts. ShutterstockLaser sintering can turn powdered metal into complex structures. 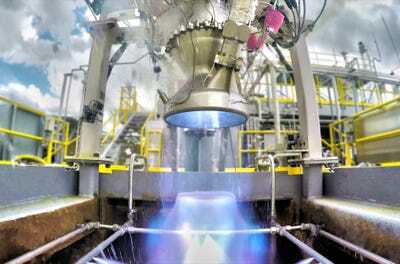 Blue OriginA test firing of Blue Origin’s methane-burning BE-4 rocket engine. That’s why Relativity Space thinks it has a strong value proposition. 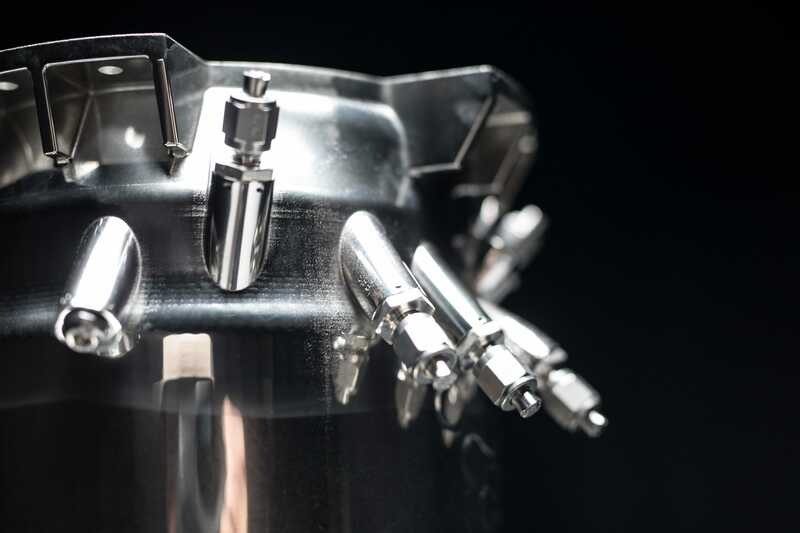 “Other companies, by our estimates, are 3D-printing less than 1% of their parts, and we’re looking at achieving 95% by the end of 2020,” Ellis said, referring the company’s planned “Terran” rocket. 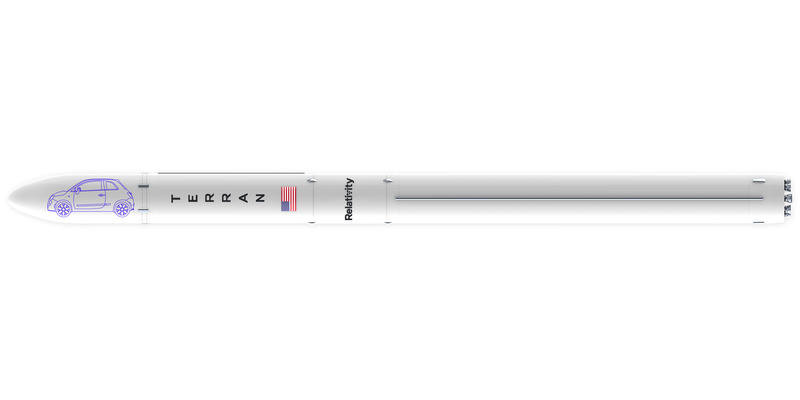 Relativity SpaceA scale illustration of Relativity Space’s Terran rocket, which has roughly a car’s worth of space in its fairing. Instead of roughly 100,000 parts, Terran might use just 1,000. The system is designed to launch up to a car-size satellite into low-Earth orbit. Ellis said he got his start with internships at Blue Origin and eventually earned a full-time job there. He co-founded Relativity Space with another engineer named Jordan Noone and now serves as CEO. Noone, the company’s CTO, is a former SpaceX employee who worked on Musk’s Dragon spaceships and engines. Noone also interned at Blue Origin for a few months in 2013, while Ellis was at the company. 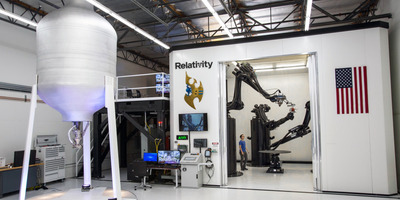 Relativity Space is headquartered in western Los Angeles and has raised about $US45 million since its founding in 2015, according to Ellis. Relativity SpaceThe offices of Relativity Space in Los Angeles, California. The startup also has a partnership with NASA’s Stennis Space Center in Mississippi to test rocket engines. 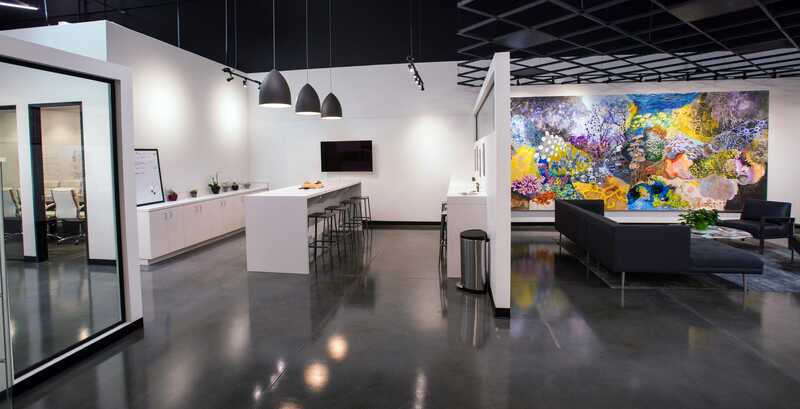 In total, Relativity Space has about 40,000 square feet of manufacturing and office space, employs 35 full-time staff, and has 14 advisors and consultants. 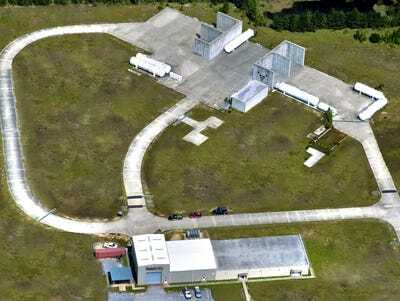 Relativity SpaceRelativity Space’s rocket engine testing facility at NASA’s Stennis Space Center in Mississippi. 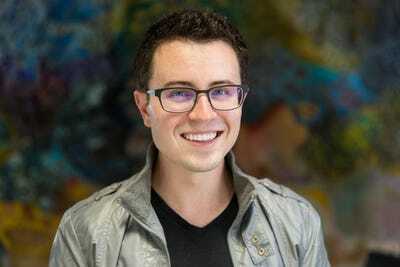 One newly acquired advisor is Tim Buzza, who was SpaceX’s fifth employee. (He worked for Musk for nearly 12 years.) 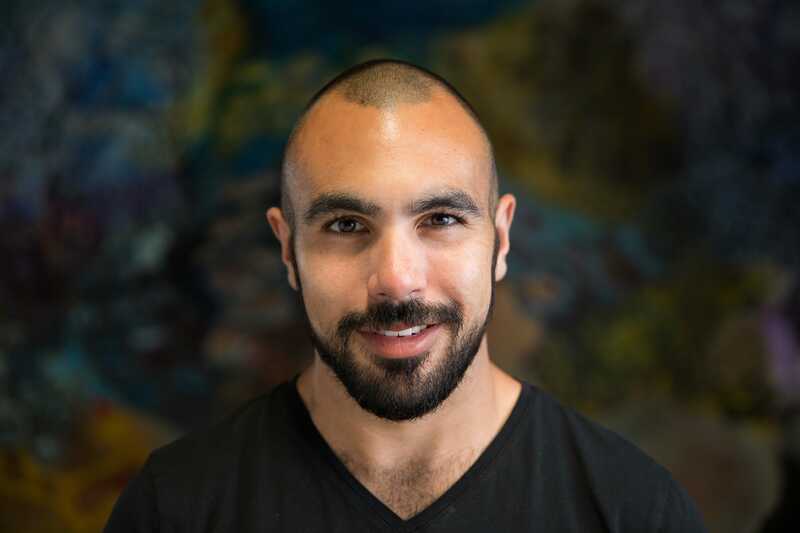 Buzza is an aerospace engineer and most recently served as the vice president of the launch program at Virgin Orbit, Richard Branson’s rocket startup. There’s also Tobias Duschl, a former executive at Tesla — Musk’s electric car company — who joined Relativity Space on Monday. 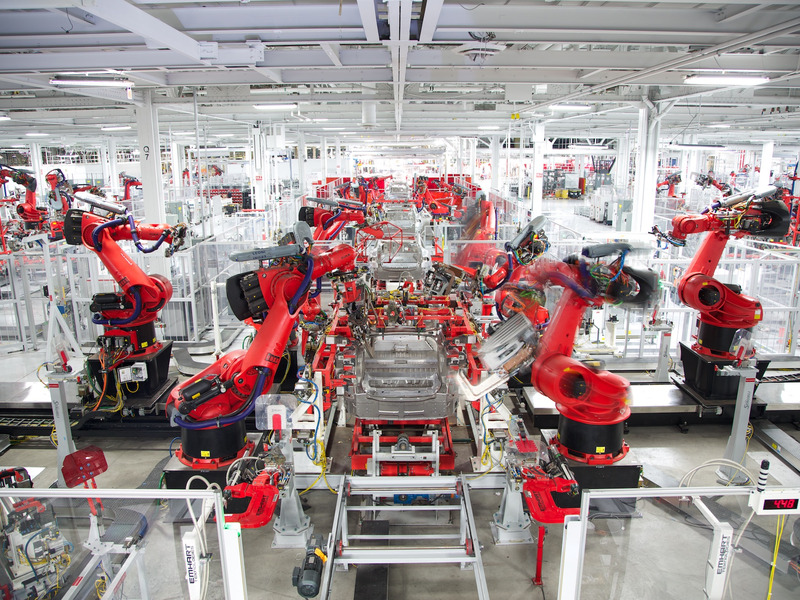 “Tobi was regarded as transformational within Tesla and is known for reducing cycle times and drastically boosting productivity,” said a representative for Relativity Space. Such experience should come in handy as the startup tries to automate its rocket production. 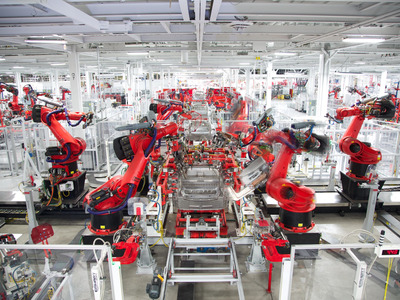 TeslaA view inside the partly automated electric car factory of Tesla Motors. The company’s 3D-printing approach could vastly reduce complexity and increase reliability, Ellis said, in addition to speeding up rocket development and manufacturing. “Rockets built and flown in days instead of years,” boasts a slogan on Relativity Space’s website. 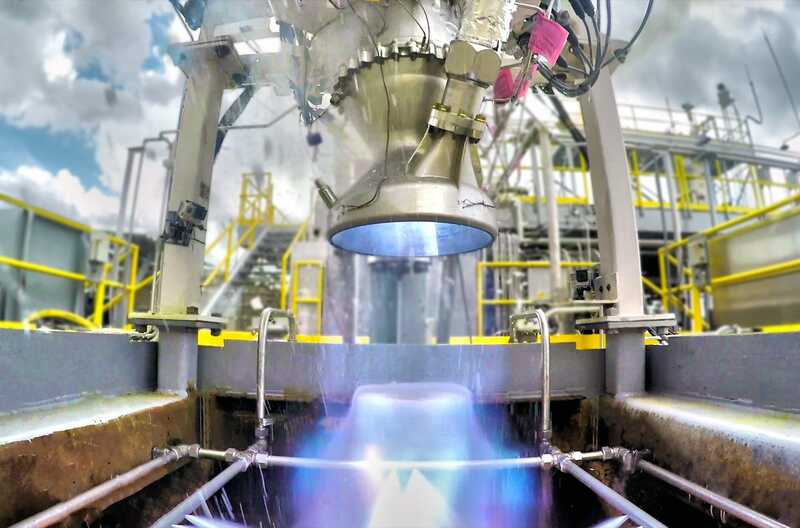 One of the company’s major test cases is its first rocket engine, called Aeon. 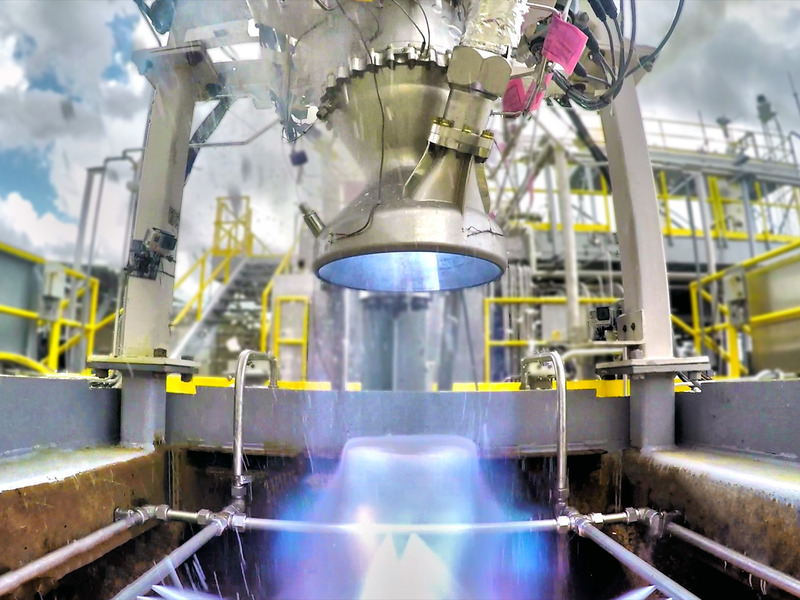 Relativity SpaceEach of Relativity Space’s Aeon rocket engines is created with a 3D printer. 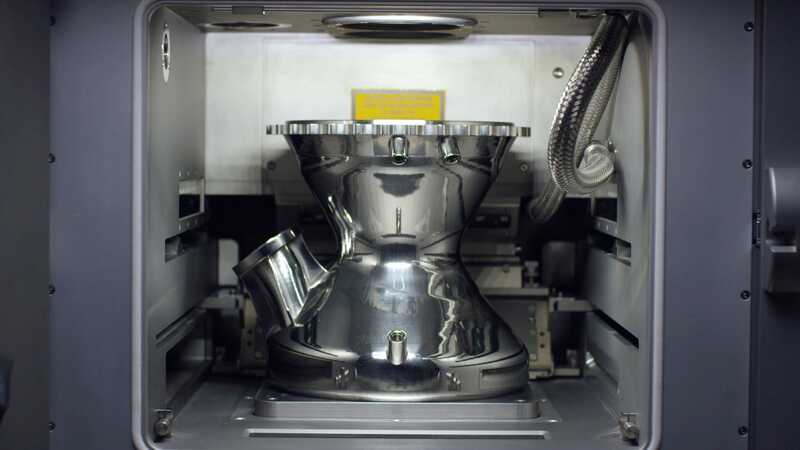 Each Aeon engine starts out as high-temperature nickel alloy in powdered form. Relativity SpaceA technician pours metal powder into a hopper of a laser-sintering 3D printer used by Relativity Space. 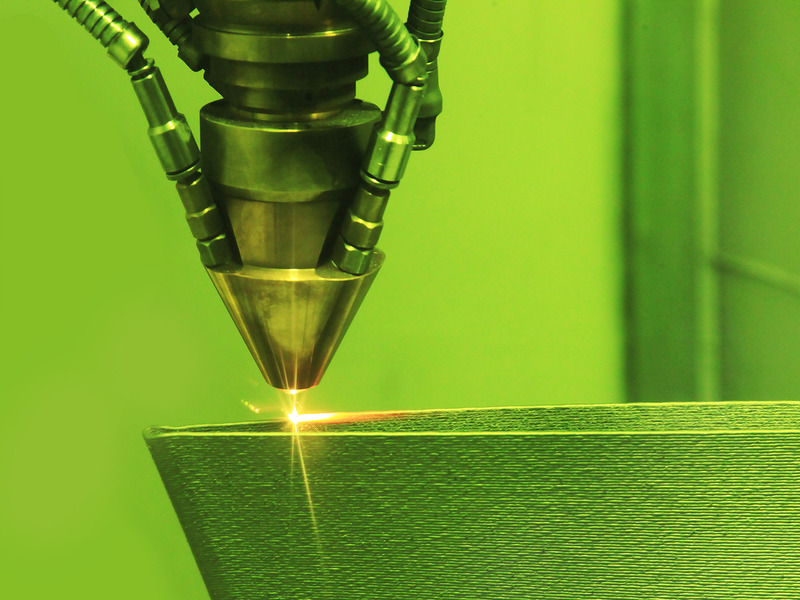 Over the course of days, lasers sinter the powder into shapes that would otherwise be difficult if not impossible to create using molds. The consistency and strength of the finished product is also easier to control. 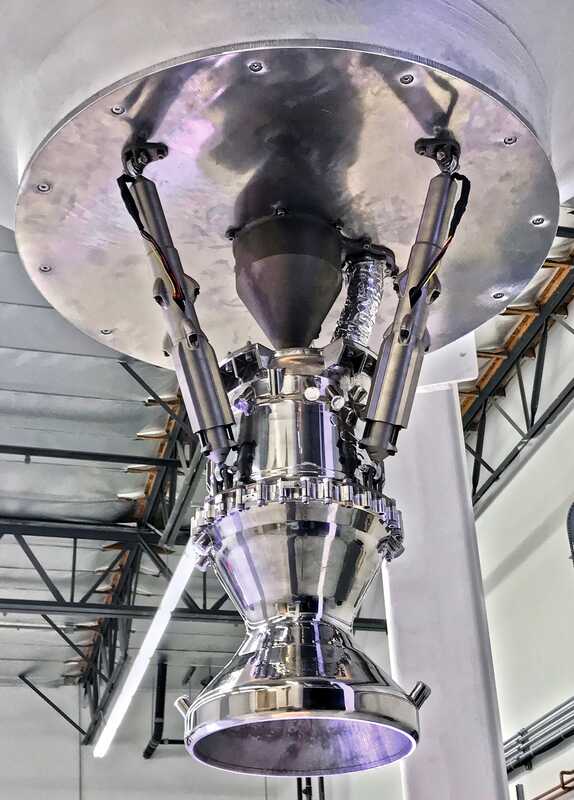 Relativity SpaceA 3D printer uses lasers to melt and sinter metal powder, layer-by-layer, into part of Relativity Space’s Aeon rocket engine. Out of these industrial printers comes a single part. Building a similar structure with more traditional methods might require hundreds of parts welded together, along with countless bolts, nuts, and other fasteners, and months of effort. 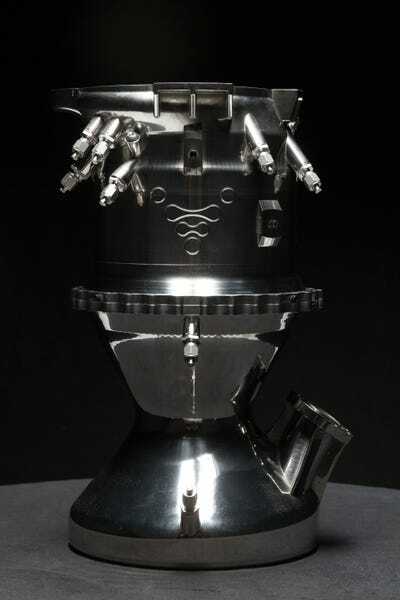 Relativity SpacePart of an Aeon rocket engine sits insides a 3D printer. “No one has really innovated on the fundamental manufacturing problems that the aerospace has dealt with over the past 50 years,” Ellis said. Relativity SpacePart of an Aeon rocket engine. “They have all had a huge amount of hands-on labour and very complex supply chains. 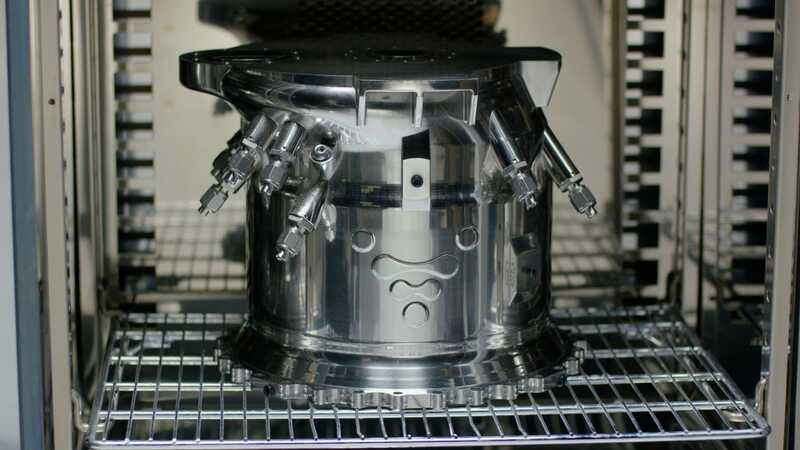 3D printing … removes complex tooling, it’s very fast, and it reduces the labour required to make each product,” he added. Relativity SpaceA close-up of an Aeon rocket engine, which Relativity Space creates using a 3D printer. Relativity SpaceRelativity Space’s Aeon rocket engine on a test stand. So far, it appears to be working. The first version of Aeon was designed, built, and test-fired within six months of Relativity Space’s founding. That’s extremely fast in the rocketry universe. Relativity SpaceThe 3D-printed Aeon rocket engine fires from a testing stand at NASA’s Stennis Space Center in Mississippi. 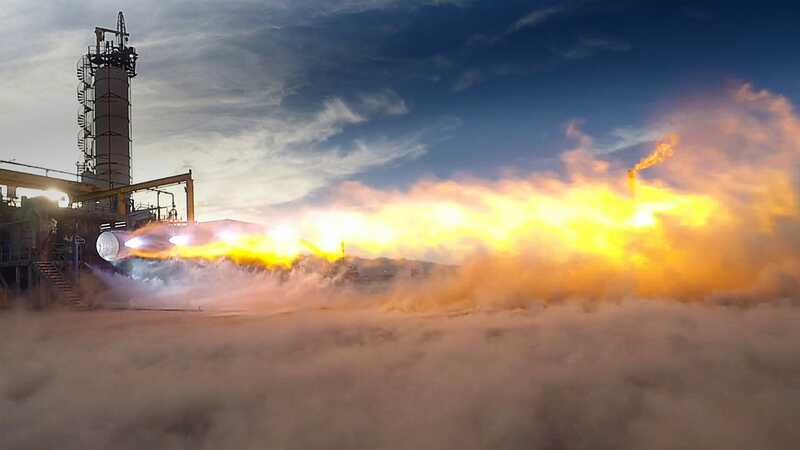 Versions of the Aeon engine have since been test-fired about 100 times at NASA’s Stennis Space Center, and 10 will eventually go into each Terran rocket. Relativity Space is building another rocket-engine test stand in Mississippi to speed up its development program for Terran. 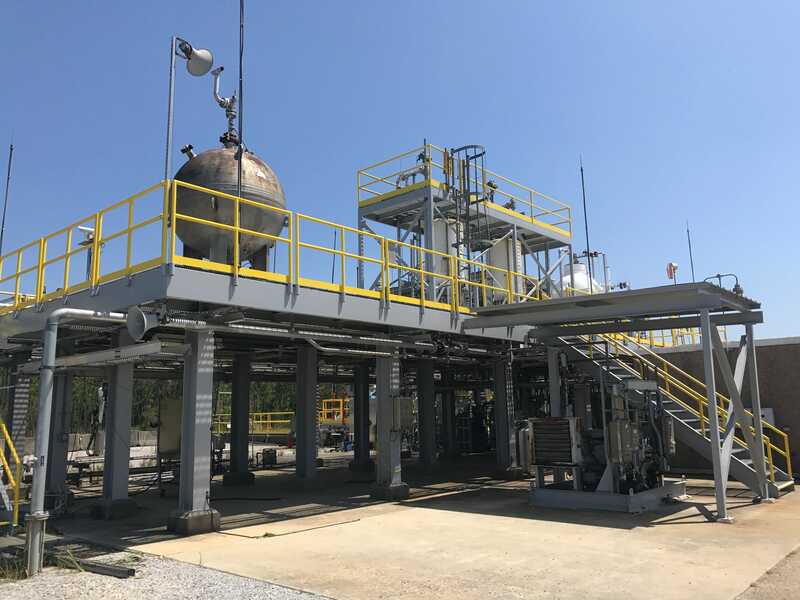 Relativity SpaceA test-firing stand for rocket engines at NASA’s Stennis Space Center in Louisiana. Ellis said the Terran rocket should be reusable and inexpensive to make. 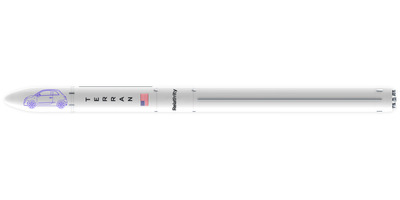 The goal is to start with smaller payloads and be price-competitive with SpaceX’s Falcon 9 rocket. 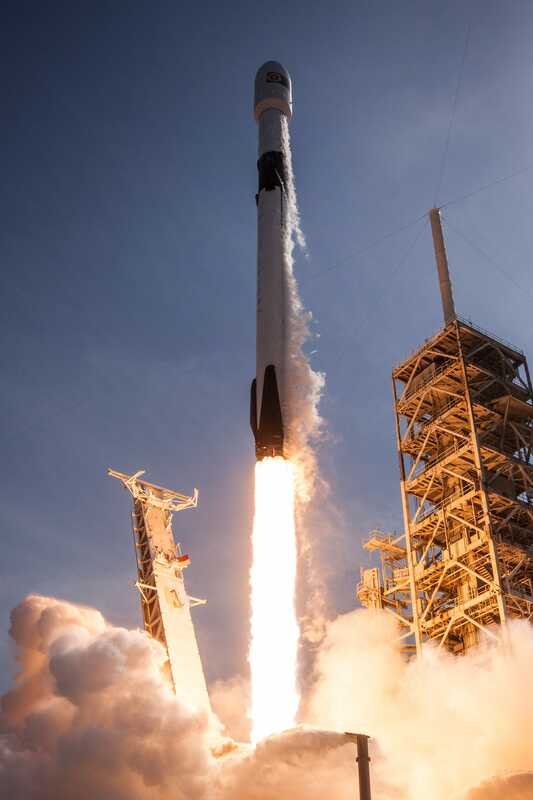 SpaceX via Flickr (public domain)A Falcon 9 rocket launches toward space. 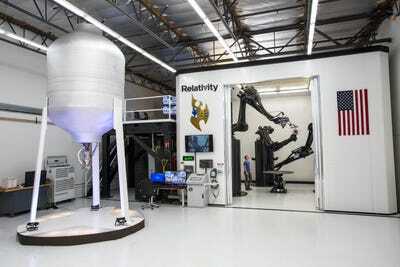 However, Relativity Space sees itself eventually printing larger and even more economical rockets. Relativity Space’s success or failure will ride on its Stargate system: the largest metal 3D printer on Earth, according to Ellis. It’s designed to be the core technology that enables printing big rocket parts. One Stargate system has already been built, but it’s still being developed and tested. Ellis said Stargate’s cameras, sensors, and advanced software “make the printer more intelligent” than other 3D printers. 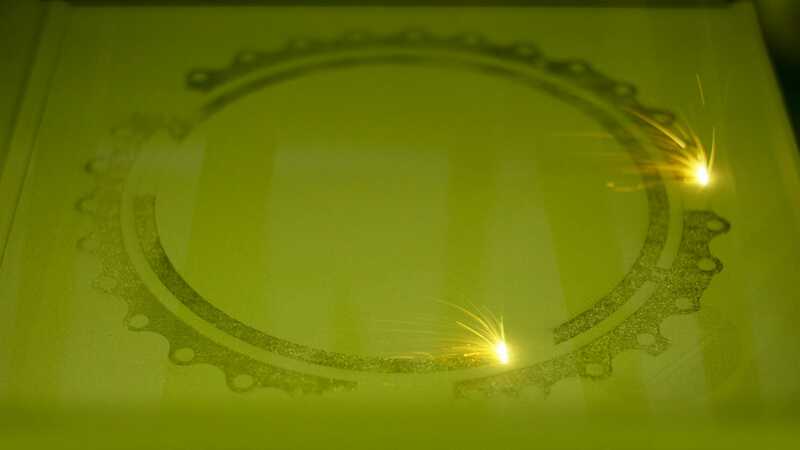 For example, Stargate can study its own work, detect flaws, and even teach itself how to print complex parts faster. Relativity SpaceStargate has already printed a prototype of a large rocket propellant tank (left). Ultimately, Ellis wants a Stargate-like system fly on a Mars-bound mission — perhaps in the cargo hold of SpaceX’s upcoming Big Falcon Rocket (or BFR). Such a spacecraft should be big enough to carry a versatile 3D-printing factory. 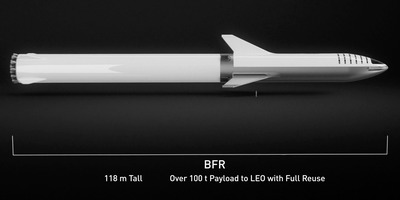 SpaceXA scale diagram of SpaceX’s Big Falcon Rocket showing its booster and spaceship. 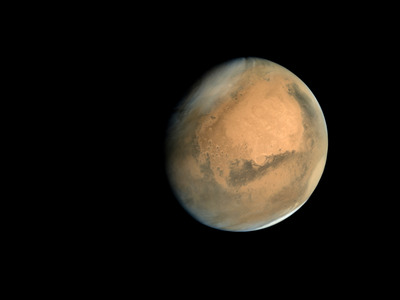 A 3D printer on Mars could help colonists build necessary things like habitats. Instead of transporting these large, cumbersome structures to the planet, a factory made by Relativity Space might use Martian dirt to quickly build robust off-world homes. NASAAn illustration of a 3D-printed Mars habitat. SpaceXAn illustration of the spaceship of SpaceX’s Big Falcon Rocket, or BFR, landing on Mars. 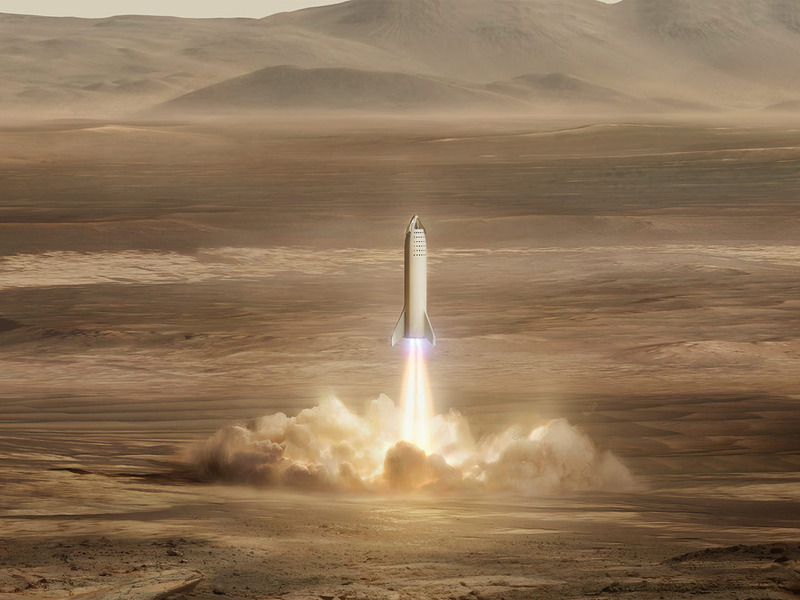 SpaceXAn illustration of spaceships of SpaceX’s Big Falcon Rocket system, or BFR, helping colonize Mars. But for such a scheme to work, a 3D-printing factory would have to be able to use raw Martian materials as inputs. “If 3D-printing on other planets really, really works, and it’s able to print large parts, that’s a game-changing thing,” Cáceres said. ISRO/ISSDC/Emily Lakdawalla (CC BY-NC-SA 3.0)A photo illustration of the red planet using imagery taken by the Mars Orbiter Mission. This story has been updated with new information. It was originally published on October 21, 2018.